It’s around this time of year that all the top Japanese builders release their latest customs. 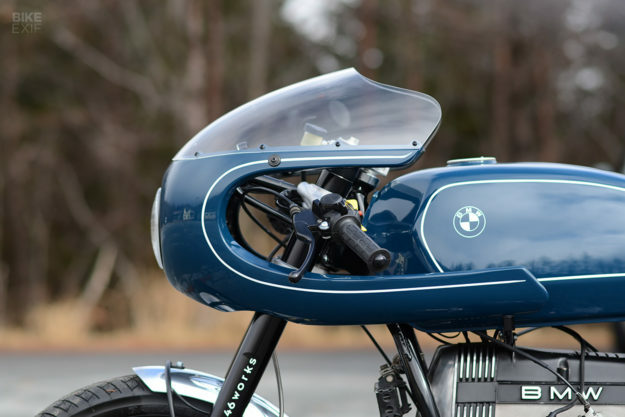 Many workshops have spent weeks burning the midnight oil to get a bike ready for display at the Yokohama show, but Shiro Nakajima of 46Works has been even busier than most—he’s just revealed two amazing new builds. 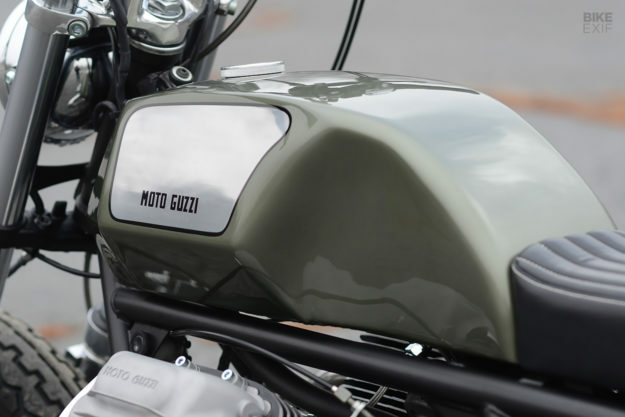 We’ve been following Nakajima-san’s work very closely over the years, going back to his days as CEO of Ritmo Sereno, Japan’s premier BMW and Moto Guzzi restomod outfit. So when he told us he had not one but two motorcycles to show, we were almost as excited as Japanese game show hosts. 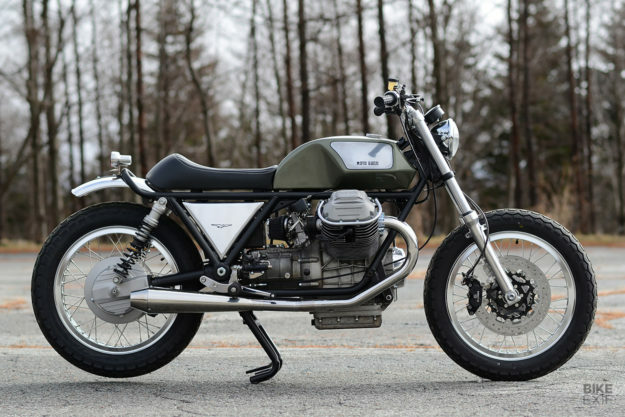 Nakajima has played to his strengths here, with a BMW R100RS and a Moto Guzzi Le Mans 1000—two platforms that he’s very familiar with. 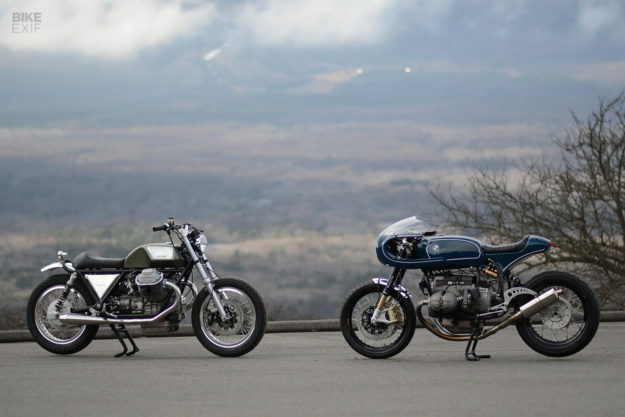 And he’s given both machines with an elegant vintage style that’s light years away from the slightly stodgy factory bikes. 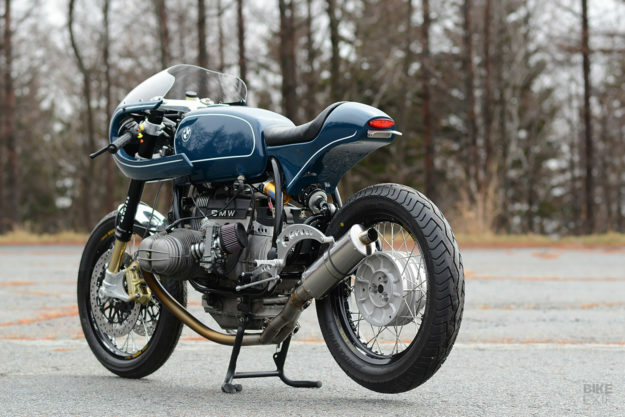 It’s a 1991 R100 RS, which means it’s a 980cc boxer. This one’s a rare monolever model; only around 180 were sold in the USA, and a few more were sold in Japan. Nakajima is focused on performance, so he’s upgraded the forks to a Yamaha/Öhlins and installed them using modified Ducati triple trees. Brembo calipers clamp down on Sunstar discs, aided by a Brembo Radial master cylinder. The rear suspension is completely reconfigured, and carefully tuned: Nakajima is a racer as well as a builder. The monoshock setup remains, but he’s hooked the Öhlins damper up to a beautifully engineered cantilevered swingarm, with extra metal reinforcement between the tubes. The rims are Excel’s finest, laced up to a Yamaha hub at the front and an R80G/S hub at the back. The tires are Bridgestone Battlax BT45, a sport/touring compound with good grip and a reasonably classic tread. To bring the R100RS frame into the 21st century, Nakajima has reinforced it for extra strength. 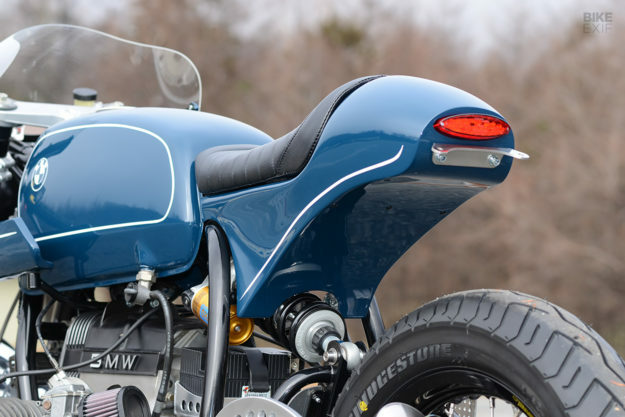 He’s reshaped the back end too, with new aluminum tubing concealed by a pert tail unit fashioned out of fiberglass and topped off with a classy black leather seat from RazzleDazzle. 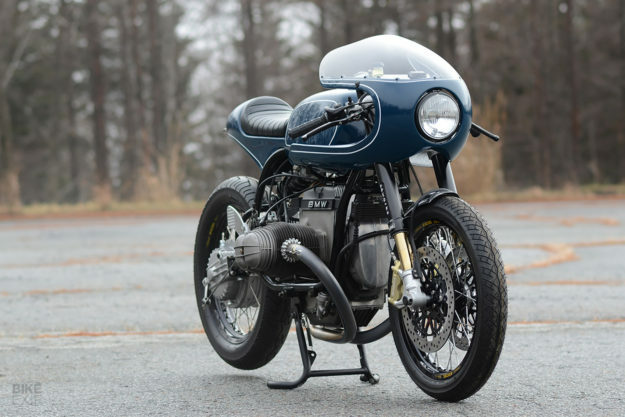 The tank looks familiar, but it’s a transplant—from a US-spec R75/6. 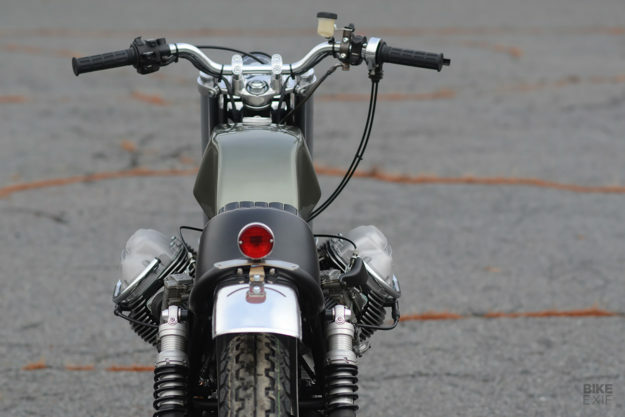 And it’s a perfect match to the custom fiberglass fairing, fronted by a classic Bates headlight. The rebuilt motor now breathes easy via state-of-the-art Keihin FCR carbs, capped with K&N filters. For the exhaust end, Nakajima has crafted titanium pipework—no easy task, given the expense of the material and the thin walls. We reckon he’s nailed it. 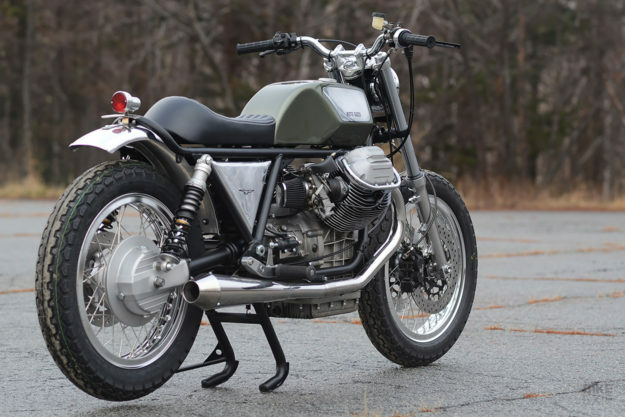 The BMW has quite a few parallels with the Moto Guzzi that Nakajima unveiled at the same time. It has the same timeless elegance, and it’s also sporting the Keihin FCR/K&N combo. Nakajima’s installed 41mm Showa forks, using modified Honda triples to get them to fit, with classic twin shocks at the back made by Öhlins. 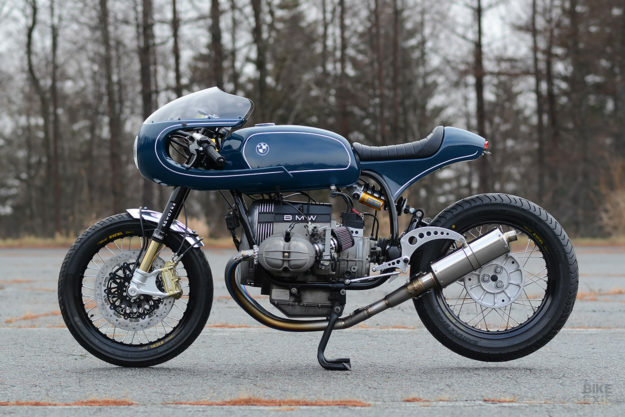 Everything else is a real mash-up, but it works: a Yamaha hub and brake rotors at the front, a Guzzi hub and Kawasaki rotor at the back, Excel rims, and Brembo calipers all round. 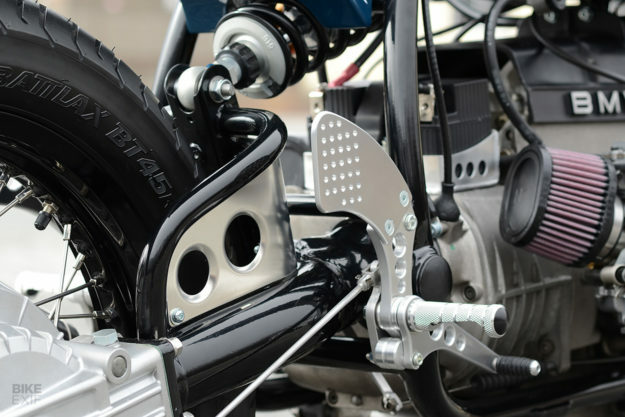 The Le Mans showcases Nakajima’s metal shaping chops, with a hand-made aluminum tank, a sharp upkick to the new subframe, and a stubby, scrambler-style rear fender. The seat extends the curve of the tank, aligns with the frame ‘triangle,’ and looks exceptionally comfy too—proof that not every custom needs an ironing board perch to look stylish. 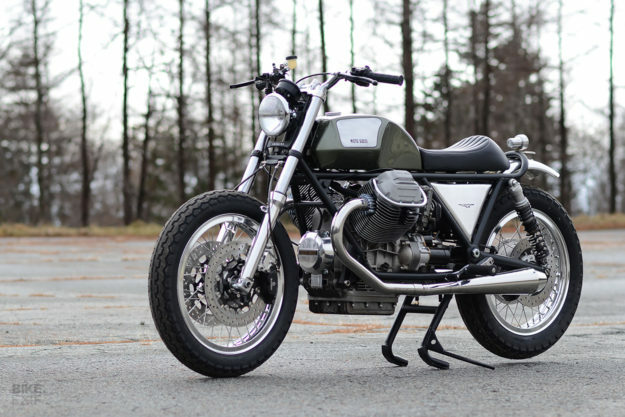 Adding to the 70s vibe are a stainless steel exhaust system with reverse cone mufflers, and Dunlop TT100GP tires, which are popular with classic racers. We like it very much too. 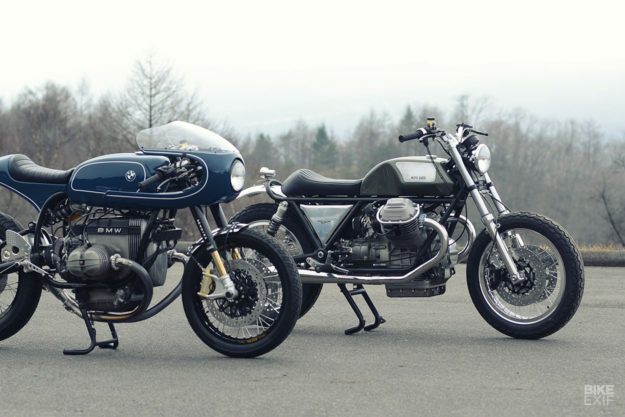 Would it be too much to wish for both these bikes in one’s garage?